Journeying through the modern world with ancient ways. I like a lot of what Queenmother Imakhu has to offer. I know some criticize her, but I found her wisdom to be helpful and transforming. I’ve signed up for her course on personal transformation and, with her permission, am sharing that information. You can find out more on facebook and through her shenu yoga website. Categories: Uncategorized | Tags: classes, Kemetic, Kemeticism, pluggery, Queenmother Imakhu, transformation | Permalink. One of the things I haven’t discussed in better detail are offerings. It seems pretty apparent what they are, but I thought I’d delve into their purpose and the type of offerings. Offerings are items which are presented to a god as part of prayer. In this sense, I’m using prayer to include ritual use and not solely petitioning. Offerings served different purposes such as providing nourishment for a god, purification, dressings, as well as other purposes. In Ancient Egypt offerings consisted of food, drink, bouquets of flowers, livestock, cosmetics, clothing, as well as votive offerings. I’ll go into a little bit more detail with each category so it’s understood a bit more for the beginner. This is pretty straight forward. It is believed the gods needed sustenance and it’s provided for Them. There were possibly some foods which weren’t offered, but this is up for debate as taboo foods were found in the offerings. There are known offerings of foods, such as various breads, cooked meats, in addition to fruits and vegetables. As with many things in Kemetic rituals these have symbolic significance. Bread was a staple in Ancient Egypt. It was also a common offering. In one temple Amun was offered different types of breads. I’m sure bread was tied to some symbolism in ritual, but my research hasn’t turned up much on what that is. Some of the meats offered were from animals which may confuse beginners. Some of the animals have dual representations not only of gods but creatures labeled as “the enemies of Ra”, which were also representations of enemies of the king. More on this fact in a moment. Produce was also offered in Ancient Egypt. One of the most notable offerings occurs in the ritual of The Offering of the First Fruits. In this instance the offering marks part of a ritual of the beginning of the harvest season. Like food offerings this is also self-explanatory. Some of the offerings include water, milk, beer, and wine. Possibly the most common liquid offering is water. Every temple had a water source from which to draw. Modern Kemetics offer water to the gods as it is easily accessible for many. In ancient times they recited a formula while offering water. This is done today by some groups, the Kemetic Orthodoxy being one. While all offerings coincided with some utterance formula the others are less accessible for some. other alcoholic drinks. The most common issues are alcohol abstinence or being underage. Luckily there are alternatives today, such as non-alcoholic beer. If I don’t offer beer physically I have some image of a beer jar as a stand-in while I recite the beer offering. In modern times this is a fairly popular offering still, even though the other common offering is equally available for some. Wine represented a couple of things in rituals, and it depends on the context which symbolism is used. In most cases wine is offered in connection with Wesir and rebirth, not to mention the association with crops (and with wine in this respect). As is the case with beer some may not offer wine due to abstinence from alcohol or being underage. I’ve seen some Kemeticists subsitute grape juice. I’ve also seen non-alcoholic wine (though I’m not sure how it’s processed to be like wine and non-alcoholic), though I’ve not heard of Kemeticists substituing this for actual wine. I personally have an image of a wine jug stand in for the wine while I recite the offering. Another drink offering was milk. The significance of the liquid is not only purity (thanks to the color and its association with purity) but also in strengthening. The latter association refers to mostly child deities –for example, Harsomtu –though other gods sometimes received milk as well. Various types of livestock were also offered in Ancient Egyptian rituals, namely cattle and waterfowl. While obviously offered during temple rituals and not by the layman the livestock offerings had their place. The livestock and slaughtering of it usually represented some enemy of a god (and also the king) which was considered subdued. In this way it was considered upholding Ma’at when the meat was prepared for cooking after the slaughtering. In Ancient Egypt bouquets of flowers were also presented to the gods. They were even presented for certain rituals. Unfortunately I can’t see to find anything else about them nor their significance, but the bouquets offered in temples were later distributed to the tombs of the king during certain holidays. Votive offerings are essentially items which are offered to a deity. They can take on many forms, but it was offered with the premise that it stood in place of something in order to answer a prayer. While most votive offerings found at archaeological sites consisted of figurines, stelae of people presenting offerings to the gods, and ears (in hopes the god can hear the prayers of the person) the concept found a place in modern Kemeticism. Some use food offerings made out of clay, some offer their own figurines or artwork of a god, where others may offer jewelry or stones. In this case I have a prayer jar representing the votive offerings, a practice I learned from the Kemetic Orthodoxy which has a similar function. Modern Kemeticists offer additional foods which weren’t available during the time period. Since these seem to be accepted without too many reservations (if any at all) it tends to fall under Unverified Personal Gnosis (UPG). Some of these offerings include: chocolate; coffee; tea; instant ramen; various candies; toys; bacon; and New World meats like turkey. The offerings vary in significance from shared gnosis of certain deities enjoying such offerings to the devotee’s available resources. This doesn’t indicate the offerings are deemed insignificant by the devotee, however. Oftentimes the offerings are presented with sincerity and honest intentions. Due to the nature of such offerings, however, it can be hard for a new devotee to assess if a UPG-based offering is deemed welcome by a deity. The question becomes, then, how to assess if a deity accepts an offering outside of the more traditional offerings. Most of the time it seems to be based on the devotee’s intuition. Since the subjective nature of such offerings means a deity can accept a type of offering from several devotees and not others it leads to interesting discussions. What Happens to the Offerings? Regardless of the offering type it was removed from the offering table. I have a blog post which addresses what to do with food and liquid offerings. Votive offerings, however, were and are still handled differently. In ancient times votive figurines were buried, but most votive offerings today are kept on the shrine. Thanks to Big Rip Brewery Company for letting me show off their beer. You can learn more about them at this link. Pinch, Geraldine and Elizabeth A. Waraksa, 2009, Votive Practices. In Jacco Dieleman, Willeke Wendrich (eds. ), UCLA Encyclopedia of Egyptology, Los Angeles. Online database. Retrieved 2013. Poo, Mu-chou, 2010, Liquids in Temple Ritual. In Willeke Wendrich (ed. ), UCLA Encyclopedia of Egyptology, Los Angeles. Online database. Retrieved 2013. Categories: Kemeticism 101 | Tags: altar, belief, devotions, Kemetic, offerings, shrine | Permalink. It’s time for another holiday by my calendar, and this time it’s the Festival of the Beautiful Union. This holiday goes by other names, like The Festival of the Beautiful Embrace, The Sacred Marriage, or the Festival of the Beautiful Reunion. I’ve only seen the latter with members of the Kemetic Orthodoxy, however. Regardless of the variation of the name the holiday is celebrated the same way. The actual date of the holiday is the new moon during the third month of Shomu. Depending on the calendar observed this is marked either in May or June on the Gregorian calendar. The significance of the Festival of the Beautiful Union features some complexity. This holiday focuses on when Het-Hert marries Heru at its surface. In Dendera this roughly month and a half affair where the Het-Hert statue travels with an entourage to the Temple of Edfu, where She marries Heru-Behedity, consummates the marriage, then returns to Dendera to give birth to Ihy. Sources note this holiday marks a harvest festival as well, though it seems there is more to it. There are some mortuary elements to the holiday celebrations in addition to creation aspects. Those rituals and aspects will be addressed in later posts. The observance of the holiday is very lengthy and contains a lot of complexity. The main celebration in Edfu itself is two weeks long with an additional two weeks for preparation, the procession to Edfu also included. Each phase of the holiday repeats the same motifs but enforces the importance of the themes, which focus on the harvest, birth, and death. While the information I present is by no means exhaustive I hope to add to it as I learn more in future posts. The current posts I have will focus on the preparations in Dendera, the procession to Edfu, the rituals within Edfu, and the procession back. Bleeker, C.J. Hathor and Thoth: Two Key Figures of the Ancient Egyptian Religion. With 4 Plates. Google Books. Dieleman and Willeke Wendrich (eds. ), UCLA Encyclopedia of Egyptology Jan 2009. eScholarship. El-Sabban, Sherif. “Temple Festival Calendars of Ancient Egypt. Google books. “The Festival of the Beautiful Reunion.” Asetmeri, n.d. Web. Lloyd, Alan B. A Companion to Ancient Egypt. Google Books. Oriental Civilization 54 (1993): 59. PDF. Categories: Beautiful Union, Holiday | Tags: Beautfiul Reunion, Beautiful Union, Behedite, festival, Hathor, Heru Behedity, Hethert, holiday, Horus, Kemetic, Ma'at | Permalink. I’ve spent a lot of time devoted to my business lately. I fear I devoted so much of myself to it that I’ve neglected my blog more than usual. It’s a shame since I enjoy writing it, regardless of the reason. Much of it has to do with the transformations in my life. Transformations, for me, are very similar to changes. The difference for me lies in how the changes impact a person. I believe transformations last longer than changes. Funny enough, much of focusing on my business right now is personal. I’m at a point financially that I can afford to live on my own. 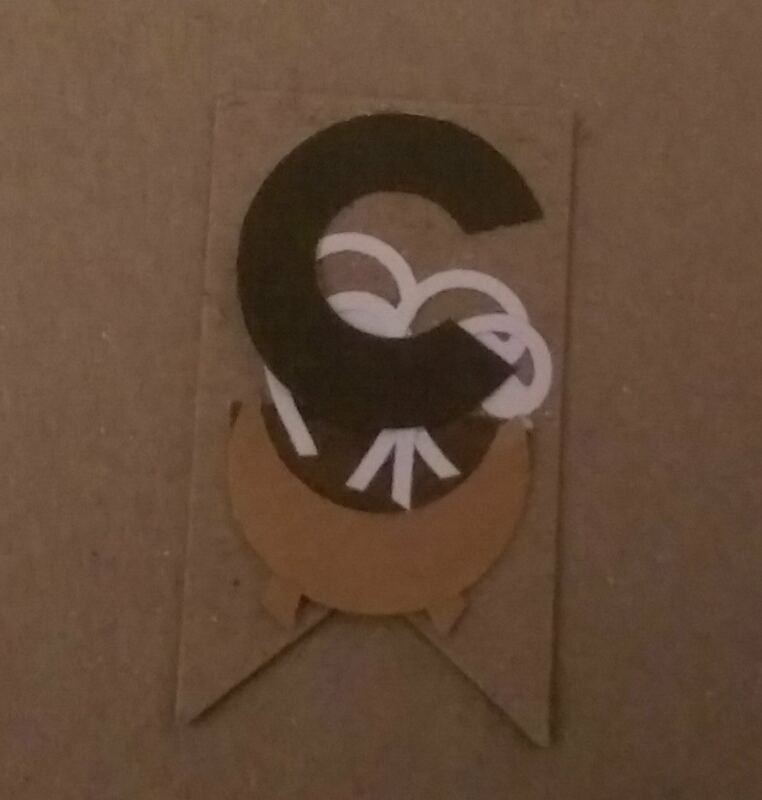 I hope to resume things with my etsy store soon enough. That is another topic for another day, though. That transformation is almost a different topic. Nonetheless I realized that I will have to change some things with the store. That will take time, and lots of it. The part few admit about change is true change takes a long time. It also takes a bit of effort to change, which is much harder when those resources for it are limited or inaccessible. I’ve had to bootstrap much of it in a way I find amusing. It’s not so much the reference to certain 80’s TV characters or a George Harrison song as much as reminiscing about my college days. My first go round as a music critic required much work and balance. Between school, work, persuing spiritual work, and then that hobby required me to grapple with a bit. Moreover it required some recognition by the community, online and off. That had its own share of obstacles. Another thing few admit about changes and transformations is their tumultuous nature. I think what really stuck out was how I left. It was spurred by a breakup combined with a sense of betrayal from the entire music scene. Around that time I received my acceptance letter for courses at the House of Netjer. I felt it signaled a time to do something I should have done a long time ago: tread my spiritual path with a bit more dedication and with less to juggle. I declared that four years ago, and I had a very bumpy path to follow. Despite the struggles, losses, and tribulations there have been some incredible gains. The certifications I’ve gathered, the diplomas, and the life experiences all culminate into the person I am now. I know for certain there are many who think I’m worse off for it, but I know my thoughts and current bitterness aside it’s just another growth spurt. In many ways I’m still that college kid who wrote her English essays between bands. Instead of writing about bands, I scribble down my contemplations about my spirituality and religious beliefs between various writing projects and playing shopkeep. I’m not moshing, but I bear a few bruises from slamming against life. My faith serves as a poultice and guides me through the pain. It is looking at those bruises now with my religious path and some of the old wounds I’ve reopened with juggling everything do I see one common pattern. As I juggle a job, my hobbies, and my blogs have I realized my major flaw in my character. I try to be too many things at once for myself and other people. I felt betrayed in the same way I’m sure others felt upset with me, maybe even felt betrayed by me: in trying to be everything I was only letting myself down. Ultimately I can only answer for who I am and what I’ve done. I should know what I want and how to rise to the occasion. That is where my transformation always emerged. I’ve learned a bit more about human nature from those final, painful moments as a music critic. I’ve learned how they apply to any setting that requires interaction and how to differentiate between a common vision and a projected vision onto me. It’s why the clarity of my vision of goals are integral. That vision includes occasionally peering into my past so I can spot things in my present cycle. I will probably always be that wide-eyed college kid trying to be everything to myself. However that doesn’t mean I am currently living as a college kid; that part of my life has ended. Instead I’ll apply those attributes to my current life so I can grow and learn new skills and attributes. Categories: Life Lessons, New Perspective | Tags: Kemetic, life lessons, Ma'at, NeoPagan | Permalink. I made this craft last year, but I felt with the spring equinox upon us I could share my rendition of this craft. Obviously I went for an Ancient Egyptian theme so I could use them around a Kemetic holiday. 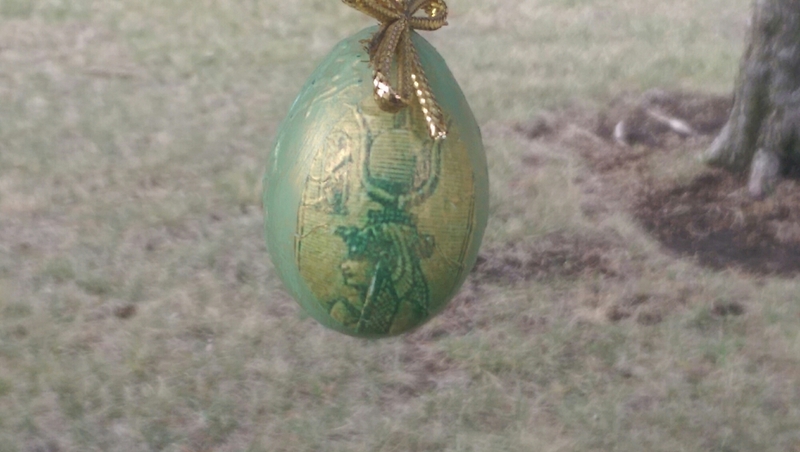 I used paper mâche eggs in lieu of real ones and an image from an Egyptian stamp. I also added a bit gold acrylic paint to add some contrast to all the green acrylic paint. I hope others give this project a try, and I’d love to see the results. 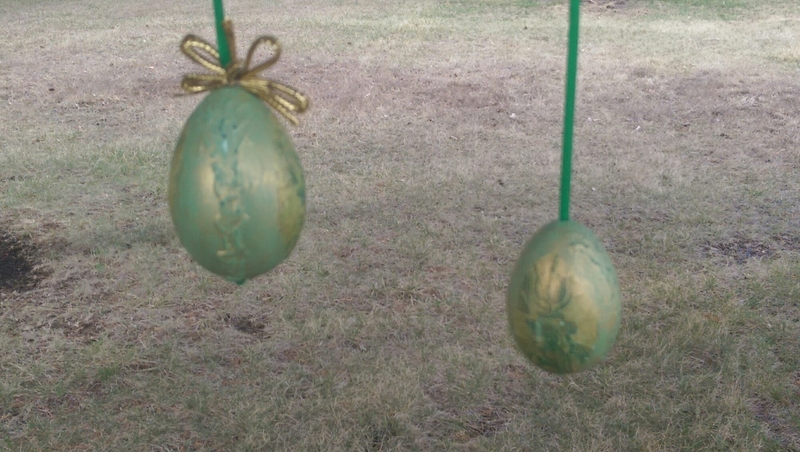 Categories: Craft Friday | Tags: Craft Friday, decoration, egg, Kemetic, NeoPagan | Permalink. In Ancient Egyptian het translates to “house”. This takes on many meanings and interpretations. We see it as a possible mortuary reference in the name Nebt-het. In this sense the “house” is a tomb. Long ago I read where the name of Het-Hert was also a way of saying She was a mother of Heru, and in that sense “house” is a reference to the womb. The Kemetic word for temple includes the word house. Imakhu presents another idea which is interesting to me. She presented the idea of one’s being as a house. It’s something I’ve appreciated. When I first listened to the podcast I decided to incorporate the concept of myself as a house. I found it to be a helpful tool. The first function this concept serves is the idea of who or what I let in my life. While I’m far from perfect at this I’ve already seen the benefits. When new people want to come into my life I can evaluate them based on what they show me. I can see if their values are similar to mine and, if not, how detrimental those differences are to me. If I think that person is too incompatible I don’t let them in to my life. There’s still the physical element of my home and what I let in. As I rebuild my life I’ve taken inventory of what I still have for a home and what I still need. Thanks to my job I can now pay for items such as towels and dishes. It’s been tough balancing just what I need as opposed to buying “in case”. Moreover I once again have the means to fill my home with items I want, things that fit my vision of a home. For me, that means a home which is calm and peaceful. I’ve picked things which I feel work to that end. In order to have the peaceful and calm home I desire I have to monitor my habits. Not only do I need to be aware of the values I share with others, or the values I want in a physical home, but I must keep dilligent in my health. When I realized I neglected my health I took measures to regain it. I reviewed my list of what I consider healthy living. After making an inventory of my health I’ve made more strides to take time for activities I enjoy, time to rest, dietary change, etc. In looking at my list I’m reminded how much of what I consider essential for my health connects to people in my life as well as what I consider a home. Home can mean many things, and for me many of those definitions intertwine. Ultimately it ties together to mean a balanced life for me. In losing some of my inner balance I lost some of my health, based on how I define both for myself. In my process of regaining those I repriortized and revised my lists and my discernment process. I am rebuilding my home. Categories: Life Lessons | Tags: het, Kemetic, life lessons, Ma'at, my way of maat, NeoPagan, pagan blog project, pbp | Permalink. I read once that flames were part of the offering in Kemetic rituals. I’m not sure how much I believe it, but I can certainly see why the person asserted that about flames. Harold H. Nelson mentioned how a torch was listed in the offerings given my Thutmose III for Ptah in Karnak. Besides mentioned in the offerings of one king there are other things to consider why someone would consider flame as part of the ritual offering. Flame not only has direct ties to ritual significance, but also religious implications. Fire is an important element in Kemetic ritual. Flames open up Kemetic rituals. There are formulas for lighting lamps (or candles for most modern Kemeticists) and extinguishing them after rituals, assuring the flame will still exist for the deity. The practical element of having flame in ritual is apparent given the darkness in some areas of the temple, which has symbolism in its own right. The flame, as with many elements in Kemetic ritual, also shares a symbolic element. In one translation of the flame being extinguished the flame is paralleled with the Eye of Heru as well as the Ra’s death and rebirth in the form of the sunset. In this respect not only is the flame “kept alive” but it is also associated with the light of a deity. Fire served another purpose besides a lighting element. Outside of lighting purposes fire plays an important role in rituals. Flame is mentioned in the formula for lighting the incense. In one formula for incense (Utterance 269 of the Pyramid Texts, R.O Faulkner’s translation) the flame is mentioned as kindled before the incense is even said to be burned. While this is obvious as to the importance of flame in incense it also hints to the connection between the flame and its sacredness in ritual. In the rituals of Amenhotep there a few connections made with fire set up for a brazier and the spit roast in connection to Heru or the Eye of Heru. The formulas for the two not only connect to the Eye of Heru, but to other deities and even the king. The possible connection to flame with the Eye of Heru further enforces not only the practicality of including the flame in ritual, but its significance to the gods. As mentioned with the flame in connection to lighting with the Eye of Heru providing the light within a deity, the Eye of Heru in this instance provides nourishment and life to the gods. In turn the gods are able to provide these necessities for their followers. Flame when connected to the gods serves as a practical as well as religious significance in Kemetic ritual. It was a way of ensuring the gods provided vital necessities to the followers by providing for Them. Part of that is accomplished by relating the flame to a deity or the Eye of Heru, while another part places emphasis on the flame in terms of how it provides for the gods. Categories: Kemeticism 101, Uncategorized | Tags: holiday, ideas, Kemetic, Ma'at, NeoPagan, offerings, paganblogproject, pbp, research, shrine, tools | Permalink. When Pagans think of eggs they usually associate it with Ostara or other Pagan faith. What most Pagans, let alone Kemeticists, realize is eggs have a symbolic significance with the Ancient Egyptians as well. It seems odd to think about eggs in Kemeticism for some, but eggs do have a place in the religion. It’s not focused on often, but it also demonstrates the limited scope of which eggs are examined. Part of that scant coverage stems from the limited scope of eggs. The egg, in one of its most obvious symbols, represents life. The cosmic egg shows up in a couple of creation stories, namely the Hermopolitan and Theban creation stories. In the Theban creation story Ptah creates the primordial egg, as mentioned in Siegried Morenz’s Egyptian Religion. The primordial egg then houses Nun. Ptah in this creation story embraces the role of a primordial deity. Djehuty, while considered a primordial deity, is not a creator of the primordial egg in His myth. In the Hermopolitan creation story Djehuty emerges from the primordial egg formed by the eight primordial gods. The egg’s association with life doesn’t end with creation. Another significance of the egg deals with creation, but in a different light, as it is also a symbol of rebirth. We see this in the Sokar festival preparations, which calls for the ingredients of the Sokar statuette to be combined and then either placed in an egg-shaped mold or formed into an egg shape by hand. Given the time of the year when the Sokar festival takes place it’s not hard to figure out the formation of this statuette is symbolic of the death and rebirth of Sokar. Some believe Sokar’s rebirth happens around a holiday now celebrated as Shamm El-Nessim, though given some research it’s hard to discern (though evidence doesn’t seem strong for it). Still, one cannot overlook how eggs play a role in the holiday as dishes with eggs are eaten and eggs are decorated. In spite of the evidence or contrary evidence of when Sokar is to emerge as reborn the link to rebirth implied during the Sokar festival preparations is not to be overlooked. The sense of birth and rebirth is not just related to Ostara when it comes to egg symbolism. The Ancient Egyptians related it to their creation stories as well to at least one holiday. There is also a holiday in which the egg possibly shares a commonality with Ostara in respect to the symbolism of eggs. Categories: Uncategorized | Tags: egg, holiday, ideas, Kemetic, living, Ma'at, NeoPagan, paganblogproject, pbp, research | Permalink. Incense is an important part of religious practice for many Kemeticists. It’s used in offerings and purifications, though this was usually demonstrated as a way of perfuming the gods. In its purpose of purification the priests used it to purify themselves before rituals. Even the pharaoh had to be purified before enacting rituals, and he too was purified through incense. Just as important as incense was the censer. The censer had a few forms, but two are most commonly seen in tombs and in art. One form was the arm-shaped censer. This was a censer with a long handle shaped as if it were an arm with the cup holder shaped like a hand. The incense cup rested on the hand. There are variants of how the arm-shaped censer looked, such as the end of the handle shaped like the head of Heru or Sokar and with some censers having a compartment for incense pellets. The other form of censer most commonly scene was the jar censer, a censer with an eponymous shape held in one’s hands during the incense offering. This was most often seen in art rather than in practice. The censers had extensive ritual use as evidenced by how many formulas in rituals call for incense. It’s used to perfume, purify, and end the ritual. Using the censer was so vital it had its own series of formulas to purify it before use in any ritual. From there various resins and incenses were used throughout the span of a ritual. These ranged from simple resins like frankincense to more complex ones like kyphi. Almost every stage of a ritual has an incense to go with it. Modern Kemeticists don’t necessarily use any particular censer. Some may use stick incense with an incense burner. 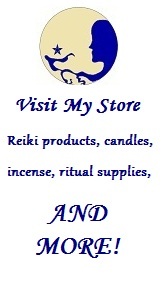 Some don’t use incense but an oil burner or a room spray. Other Kemeticists may forgo incense or fragrance oil due to health concerns. There are many options today for Kemeticists. If you’d like ideas on incense and an incense burner I have a blog post to assist to that end. Categories: Uncategorized | Tags: Kemetic, living, Ma'at, NeoPagan, offerings, paganblogproject, pbp, research, tools, writing | Permalink. I would be lying to myself if I said my beliefs haven’t been shaken to my core in recent months. Loss of a loved one, even during a break up like I’m experiencing, really does that to people and I’m no exception. If that wasn’t enough the constant loss of last year took a lot of my resolve out of me. The way I’ve dealt with my crisis of faith is a bit different from what I’ve seen others do or advised by others in my life. One thing I’ve realized after being dumped was that I have immense trust issues. It became clear when I spoke to people about my feelings. Most of my friends noted how they’d never seen me in this state and implied, whether they meant to or not, it seemed like I wasn’t capable of feeling such emotions like heartbreak and despair. I guess “incapable” is too strong of a word; it was more like improbable. They mentioned how I always seemed cold and distant. I found it odd because I imagine myself to be an open book (it comes with blogging, I feel). However that was what I kept hearing from friends I even considered close friends. When it’s a pattern like that I can’t avoid it anymore. Already I had one belief challenged. It seems silly to look at how I believe friendships work into a religious blog, but after examining this one issue I saw how it applied in other places in my life. Naturally I looked at my religious beliefs. I felt like I failed the gods, the gods failed me, or They abandoned me, or hated me in some fashion, and other forms of doubt. All of these feelings are normal with loss and I’m thankful I know that. What I wasn’t prepared for was how to proceed with my feelings. Most of the time I was advised to abandon my beliefs since they caused me pain. It occurred to me as an option. I’ve most certainly felt let down in so many ways I’m having to make changes across the board. Others wondered why I stuck with it in the fist place as it seems I have suffered so much since pursuing Kemeticism. I left Christianity because I felt it brought me great suffering, so why should I stick with Kemeticism? The question of whether I should stick to my beliefs was one I couldn’t answer, nor do I feel I can adequately answer right now. I can say when I put my religious practice aside for a bit so I could work on other things in my life I realized how important it has been to me so far. When I came to Het-Hert initially I had a new lease on life. What I didn’t realize at the time was part of renewing one’s life means healing from the life that inflicted so much harm. I’ve cried a lot and was placed in many situations where I had to face those wounds inflicted by my past. Many of those situations have occurred in a spiritual or religious environment. In facing my inner turmoil I also found healing even when it was healing provided by others. That’s because even in situations like therapy the solutions were common: keep to my religious practice and maintain a healthy lifestyle. The only thing my therapist added which others didn’t was to find healthier friendships. Combining these notions helped me heal at various points in my life. I had to examine why I felt none of this was healing me at this point in my life. In that examination I hoped to find out if I needed to leave my religion behind. During the contemplation of what served me I reflected on why I left Christianity. The very beliefs of Christianity didn’t help me as I felt I could never measure up, as if the very structure set me up for failure. I know others disagree, which is their right. It’s just my experience with it, and I left because of it. I know that because of it I felt like God hated me. Even if my experience didn’t account for anything there was still how I felt I couldn’t believe in the fundamentals of it. I never believed there was only one way to peace or happiness. I didn’t believe all of a religion’s tenets were timeless regardless if the gods seemingly change their mind or not. The idea of how someone erased all of man’s sins yet somehow we were still born with it until we become Christian made no sense to me. I couldn’t believe in a practice that used manipulation to bring in followers. So what made Kemeticism different for me? Why do I believe in the Ancient Egyptian gods enough to keep practicing and researching how to practice? In Ancient Egypt there wasn’t really much in literature to tell the laymen how to practice and behave. We have some idea thanks to archaeological evidence and surviving wisdom literature. However, there wasn’t really a set of rules for laymen. In fact they had no word for “religion” as the Ancient Egyptians saw no separation of religion and everyday life. I could easily argue I wasn’t practicing, yet I still wanted to believe. What makes this belief strong? The word “belief” stumped me repeatedly. Why did I believe in something that is not serving me? I am at a place now where I feel like I don’t measure up in my practice and on some level I felt the gods hated me. Why am I still holding on? It didn’t hit me until I found myself crying and praying to Het-Hert. I was still asking Het-Hert to get me through the pain of losing my partner in one of my moments of sorrow. I found myself praying to Her knowing She was there and I trusted Her to help in my healing. I still held on because I believed in Her. I’ve found a lot of peace and healing with Het-Hert and other Ancient Egyptian gods. I trusted Them to help me even with my faith shaken. I found a practice that bettered me and gave me new tools to be the person I want to be through worshiping Them and through my own work devoted to learning how to worship. It’s those experiences which convinced me this was a true path for me all these years. I’ve been through a lot, but it’s through those moments I’ve seen how much I’ve grown because of nothing else than believing in the gods and in some way believed in myself. I believed in myself to make the best decision. Even if I ended up choosing poorly I trusted myself enough to grow and learn. It was during that contemplation I kept running into articles which reminded me about belief and belief during moments of crises. I was reminded how sometimes bad things happen without rhyme or reason, and sometimes it’s a cluster of bad things. Not every bad thing has a pattern to it. Have I made poor choices that contributed to my problems in the past year? Yes. I’m human. I’ve also had problems that were no fault of my own as well. It’s something I say a lot on this blog, but even I need a reminder every so often that sometimes bad things happen for no reason. The gods most likely aren’t mad at me or punishing me. It’s just the series of unfortunate events combined with questionable decision-making. While I thought I was making a truthful and wise decision at the time it didn’t always prove for the best. Life happened, and I happened with it. That’s where I differentiated my beliefs with Christianity all those years ago. While contemplation of one’s faith and relationship with God was theoretically encouraged the practice was far different. The pastors never encouraged me to trust my feelings about my relationship with God. I was supposed to trust God’s decisions for better or worse on a say-so. I felt like I was constantly let down and that trust eroded. Since my trust was gone my beliefs went with it. That has not happened with my belief in Kemeticism. On some level I still trust Them. Belief, to paraphrase the definition, is about holding something to be a truth. Beliefs can change, but it’s usually because we find a new truth for ourselves. As in all exploration the way we discover our truths is by trusting it. Sometimes we have to test it in order to find it believable. After all trust is earned. Since the gods have earned my trust I’ve slowly worked into my practice again. I am slowly working myself into daily offerings again. It’s a slow effort, but one that will build up with trust. Categories: Life Lessons, My Way of Ma'at | Tags: belief, ideas, Kemetic, life lessons, living, Ma'at, NeoPagan, offerings, paganblogproject, pbp, questions, self, tools, value, writing | Permalink. Can’t find the post via category? Try the search box.